Virus latency (or viral latency) is the ability of a pathogenic virus to lie dormant (latent) within a cell, denoted as the lysogenic part of the viral life cycle. A latent viral infection is a type of persistent viral infection which is distinguished from a chronic viral infection. Latency is the phase in certain viruses' life cycles in which, after initial infection, proliferation of virus particles ceases. However, the viral genome is not fully eradicated. The result of this is that the virus can reactivate and begin producing large amounts of viral progeny (the lytic part of the viral life cycle) without the host becoming reinfected by new outside virus, and stays within the host indefinitely. Virus latency is not to be confused with clinical latency during the incubation period when a virus is not dormant. Episomal latency refers to the use of genetic episomes during latency. In this latency type, viral genes are stabilized, floating in the cytoplasm or nucleus as distinct objects, either as linear or lariat structures. Episomal latency is more vulnerable to ribozymes or host foreign gene degradation than proviral latency (see below). One example is herpes virus family, Herpesviridae, all of which establish latent infection. Herpes virus include chicken-pox virus and herpes simplex viruses (HSV-1, HSV-2), all of which establish episomal latency in neurons and leave linear genetic material floating in the cytoplasm. The Gammaherpesvirinae subfamily is associated with episomal latency established in cells of the immune system, such as B-cells in the case of Epstein-Barr virus. Epstein-Barr virus lytic reactivation (which can be due to chemotherapy or radiation) can result in genome instability and cancer. In the case of herpes simplex (HSV), the virus has been shown to fuse with DNA in neurons, such as nerve ganglia or brain cells, and HSV reactivates upon even minor chromatin loosening with stress, although the chromatin compacts (becomes latent) upon oxygen and nutrient deprivation. Cytomegalovirus (CMV) establishes latency in myeloid progenitor cells, and is reactivated by inflammation. Immunosuppression and critical illness (sepsis in particular) often results in CMV reactivation. CMV reactivation is commonly seen in patients with severe colitis. Advantages of episomal latency include the fact that the virus may not need to enter the nucleus, and hence may avoid nuclear domain 10 (ND10) from activating interferon via that pathway. Disadvantages include more exposure to cellular defenses, leading to possible degradation of viral gene via cellular enzymes. Reactivation may be due to stress, UV, etc. A provirus is a virus genome that is integrated into the DNA of a host cell. Advantages include automatic host cell division results in replication of the virus's genes, and the fact that it is nearly impossible to remove an integrated provirus from an infected cell without killing the cell. A disadvantage of this method is the need to enter the nucleus (and the need for packaging proteins that will allow for that). However, viruses that integrate into the host cell's genome can stay there as long as the cell lives. One of the best-studied viruses that does this is HIV. HIV uses reverse transcriptase to create a DNA copy of its RNA genome. HIV latency allows the virus to largely avoid the immune system. Like other viruses that go latent, it does not typically cause symptoms while latent. Unfortunately, HIV in proviral latency is nearly impossible to target with antiretroviral drugs. Both proviral and episomal latency may require maintenance for continued infection and fidelity of viral genes. Latency is generally maintained by viral genes expressed primarily during latency. Expression of these latency-associated genes may function to keep the viral genome from being digested by cellular ribozymes or being found out by the immune system. Certain viral gene products (RNA transcripts such as non-coding RNAs and proteins) may also inhibit apoptosis or induce cell growth and division to allow more copies of the infected cell to be produced. 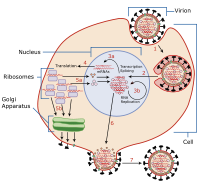 An example of such a gene product is the latency associated transcripts (LAT) in herpes simplex virus, which interfere with apoptosis by downregulating a number of host factors, including major histocompatibility complex (MHC) and inhibiting the apoptotic pathway. A certain type of latency could be ascribed to the endogenous retroviruses. These viruses have incorporated into the human genome in the distant past, and are now transmitted through reproduction. Generally these types of viruses have become highly evolved, and have lost the expression of many gene products. Some of the proteins expressed by these viruses have co-evolved with host cells to play important roles in normal processes. While viral latency exhibits no active viral shedding nor causes any pathologies or symptoms, the virus is still able to reactivate via external activators (i.e. sunlight, stress) to cause an acute infection. In the case of herpes simplex virus, which generally infects an individual for life, a serotype of the virus reactivates occasionally to cause cold sores. Although the sores are quickly resolved by the immune system, they may be a minor annoyance from time to time. In the case of varicella zoster virus, after an initial acute infection (chickenpox) the virus lies dormant until reactivated as herpes zoster. More serious ramifications of a latent infection could be the possibility of transforming the cell, and forcing the cell into uncontrolled cell division. This is a result of the random insertion of the viral genome into the host's own gene and expression of host cellular growth factors for the benefit of the virus. In a notable event, this actually happened during gene therapy through the use of retroviral vectors at the Necker Hospital in Paris, where twenty young boys received treatment for a genetic disorder, after which five developed leukemia-like syndromes. This is also seen with infections of the human papilloma virus in which persistent infection may lead to cervical cancer as a result of cellular transformation. In the field of HIV research, proviral latency in specific long-lived cell types is the basis for the concept of one or more viral reservoirs, referring to locations (cell types or tissues) characterized by persistence of latent virus. Specifically, the presence of replication-competent HIV in resting CD4-positive T cells allows this virus to persist for years without evolving despite prolonged exposure to antiretroviral drugs. This latent reservoir of HIV may explain the inability of antiretroviral treatment to cure HIV infection. ^ Villarreal, Luis P. (2005). Viruses and the Evolution of Life. Washington, ASM Press. ^ N.J. Dimmock et al. "Introduction to Modern Virology, 6th edition." Blackwell Publishing, 2007. ^ a b Minarovits J (2006). "Epigenotypes of Latent Herpesvirus Genomes". DNA Methylation: Development, Genetic Disease and Cancer. Current Topics in Microbiology and Immunology. 310. pp. 61–80. doi:10.1007/3-540-31181-5_5. ISBN 978-3-540-31180-5. PMID 16909907. ^ Souza TA, Stollar BD, Sullivan JL, Luzuriaga K, Thorley-Lawson DA (2007-09-01). "Influence of EBV on the peripheral blood memory B cell compartment". Journal of Immunology. 179 (5): 3153–60. doi:10.4049/jimmunol.179.5.3153. PMID 17709530. ^ Li H, Liu S, Hu J, Luo X, Li N, M Bode A, Cao Y (2016). "Epstein-Barr virus lytic reactivation regulation and its pathogenic role in carcinogenesis". International Journal of Biological Sciences. 12 (11): 1309–1318. doi:10.7150/ijbs.16564. PMC 5118777. PMID 27877083. ^ Thellman NM, Triezenberg SJ (2017). "Herpes Simplex Virus Establishment, Maintenance, and Reactivation: In Vitro Modeling of Latency". Pathogens. 6 (3): E28. doi:10.3390/pathogens6030028. PMC 5617985. PMID 28644417. ^ "Discovery shows how herpes simplex virus reactivates in neurons to trigger disease". 2015-12-21. ^ "Starve a Cell, Compact Its DNA - GEN". GEN. 2015-11-10. ^ Dupont L, Reeves MB (2016). "Cytomegalovirus latency and reactivation: recent insights into an age old problem". Reviews in Medical Virology. 26 (2): 75–89. doi:10.1002/rmv.1862. PMC 5458136. PMID 26572645. ^ Cook CH (2007). "Cytomegalovirus reactivation in "immunocompetent" patients: a call for scientific prophylaxis". The Journal of Infectious Diseases. 196 (9): 1273–1275. doi:10.1086/522433. PMID 17922387. ^ Sager K, Alam S, Bond A, Chinnappan L, Probert CS (2015). "Review article: cytomegalovirus and inflammatory bowel disease". Alimentary Pharmacology & Therapeutics. 41 (8): 725–733. doi:10.1111/apt.13124. PMID 25684400. ^ Burton EA, Fink DJ, Glorioso JC (Dec 2002). "Gene delivery using herpes simplex virus vectors". DNA Cell Biol. 21 (12): 915–36. doi:10.1089/104454902762053864. PMID 12573050. ^ Preston, Chris M.; Efstathiou, Stacey (21 September 2018). "Molecular basis of HSV latency and reactivation". In Arvin, Ann; Campadelli-Fiume, Gabriella; Mocarski, Edward; Moore, Patrick S.; Roizman, Bernard; Whitley, Richard; Yamanishi, Koichi (eds.). Human Herpesviruses: Biology, Therapy, and Immunoprophylaxis. Cambridge University Press. ISBN 9780521827140. PMID 21348106 – via PubMed. ^ Divito S, Cherpes TL, Hendricks RL (2006). "A triple entente: virus, neurons, and CD8+ T cells maintain HSV-1 latency". Immunol. Res. 36 (1–3): 119–26. doi:10.1385/ir:36:1:119. PMID 17337772. ^ Carpenter D, Hsiang C, Brown DJ, Jin L, Osorio N, Benmohamed L, Jones C, Wechsler SL (Dec 2007). "Stable cell lines expressing high levels of the herpes simplex virus type 1 LAT are refractory to caspase 3 activation and DNA laddering following cold shock induced apoptosis". Virology. 369 (1): 12–8. doi:10.1016/j.virol.2007.07.023. PMC 2276668. PMID 17727910. ^ Buzdin A (Nov 2007). "Human-specific endogenous retroviruses". ScientificWorldJournal. 7: 1848–68. doi:10.1100/tsw.2007.270. PMC 5901341. PMID 18060323. ^ Hayashida K, Omagari K, Masuda JI, Kohno S (2007). "An integrase of endogenous retrovirus is involved in maternal mitochondrial DNA inheritance of the human mammal". Biochem Biophys Res Commun. 366 (1): 206–211. doi:10.1016/j.bbrc.2007.11.127. hdl:10069/22710. PMID 18054325. ^ Hacein-Bey-Abina, S; Garrigue, A; Wang, GP; Soulier, J; Lim, A; Morillon, E; Clappier, E; Caccavelli, L; Delabesse, E; Beldjord, K; Asnafi, V; MacIntyre, E; Dal Cortivo, L; Radford, I; Brousse, N; Sigaux, F; Moshous, D; Hauer, J; Borkhardt, A; Belohradsky, BH; Wintergerst, U; Velez, MC; Leiva, L; Sorensen, R; Wulffraat, N; Blanche, S; Bushman, FD; Fischer, A; Cavazzana-Calvo, M (September 2008). "Insertional oncogenesis in 4 patients after retrovirus-mediated gene therapy of SCID-X1". The Journal of Clinical Investigation. 118 (9): 3132–42. doi:10.1172/JCI35700. PMC 2496963. PMID 18688285. ^ Wang XG, Revskaya E, Bryan RA, Strickler HD, Burk RD, Casadevall A, Dadachova E (Oct 2007). "Treating cancer as an infectious disease-viral antigens as novel targets for treatment and potential prevention of tumors of viral etiology". PLoS ONE. 2 (10): e1114. doi:10.1371/journal.pone.0001114. PMC 2040508. PMID 17971877. ^ Molho-Pessach V, Lotem M (2007). Viral carcinogenesis in skin cancer. Curr Probl Dermatol. Current Problems in Dermatology. 35. pp. 39–51. doi:10.1159/000106409. ISBN 978-3-8055-8313-8. PMID 17641489. ^ Carrillo-Infante C, Abbadessa G, Bagella L, Giordano A (Jun 2007). "Viral infections as a cause of cancer (review)". Int J Oncol. 30 (6): 1521–8. doi:10.3892/ijo.30.6.1521. PMID 17487374. ^ a b Blankson JN, Persaud D, Siliciano RF (2002). "The challenge of viral reservoirs in HIV-1 infection". Annu. Rev. Med. 53: 557–93. doi:10.1146/annurev.med.53.082901.104024. PMID 11818490. ^ Finzi D, Hermankova M, Pierson T, et al. (November 1997). "Identification of a reservoir for HIV-1 in patients on highly active antiretroviral therapy". Science. 278 (5341): 1295–300. doi:10.1126/science.278.5341.1295. PMID 9360927. ^ Persaud D, Pierson T, Ruff C, et al. (April 2000). "A stable latent reservoir for HIV-1 in resting CD4(+) T lymphocytes in infected children". J. Clin. Invest. 105 (7): 995–1003. doi:10.1172/JCI9006. PMC 377486. PMID 10749578. ^ Chun TW, Fauci AS (September 1999). "Latent reservoirs of HIV: obstacles to the eradication of virus". Proc. Natl. Acad. Sci. U.S.A. 96 (20): 10958–61. doi:10.1073/pnas.96.20.10958. PMC 34225. PMID 10500107.